Dec 25 / Merry Christmas from the BrideMalta.com Team! Oct 29 / Damian's Cocktails updates contact details and new website. Oct 11 / Big Mama Entertainment - NEW VENDOR Special Ideas! Aug 12 / BOX4FUN - NEW VENDOR Special Ideas! Dec 1 / New venue pics posted by Island Caterers Ltd.
Nov 21 / Updated photos of Invitations by Boo & Co.
Jun 16 / Debbie @ Romano Cassar featured as a top florist on Style Magazine. Feb 14 / "Wedding on St. Valentine's Day" perfect article for today! May 4 / 9 beautiful gowns advertised in Buy & Sell! Feb 6 / Quick Competition by Kudos! Feb 1 / Two Wedding Events happening this February! Dec 9 / The newly redesigned BrideMalta.com is now live! Dec 3 / Freelax.com.mt - NEW VENDOR New Ideas! Sep 2 / 3 beautiful gowns advertised in Buy & Sell! Jul 1 / Win €150 voucher from Damian's Cocktails! May 5 / 3 beautiful gowns advertised in Buy & Sell! Mar 22 / Inspirations 2013 at Phoenicia Hotel starts today. Mar 11 / bride&co. Wedding Guidebook launch website! Jan 28 / 3 beautiful gowns advertised in Buy & Sell! Dec 5 / EasySavings.com.mt - NEW VENDOR New Ideas! Oct 5 / 3 beautiful gowns advertised in Buy & Sell! Aug 14 / 3 beautiful gowns advertised in Buy & Sell! Jan 28 / Viva Vegas Ltd. - NEW VENDOR New Ideas! Dec 6 / 3 beautiful gowns advertised in Buy & Sell! Sep 13 / The Photo Booth Guys - NEW VENDOR New Ideas! Sep 12 / Photo Booth Malta - NEW VENDOR New Ideas! Aug 18 / 3 beautiful gowns advertised in Buy & Sell! Jul 18 / FREE bottle of Sparkletini from Piscopo Co. Ltd.
May 3 / Marusca updates her Bridal Challenge Diary! 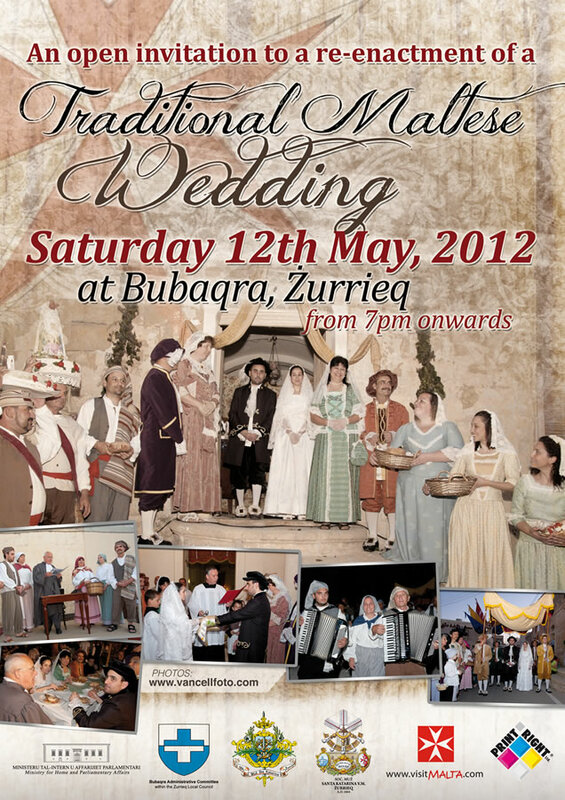 Apr 15 / BrideMalta.com Fanpage reaches 1500 fans! Mar 30 / 2 beautiful gowns advertised in Buy & Sell! Mar 11 / 4 beautiful gowns advertised in Buy & Sell! Dec 29 / 4 beautiful dresses advertised in Buy & Sell! Jul 7 / Partytrap Animation - NEW VENDOR New Ideas! May 7 / 2 beautiful dresses advertised in Buy & Sell! Apr 27 / Animator - NEW VENDOR New Ideas! Sep 30 / IJS Home offers 100 €25.00 vouchers! Aug 10 / Mrs. Jones new Bridal Gowns and Evening Wear. Jul 28 / Cleland & Souchet launch PASHA outdoor furniture. Jul 25 / Jurgen Briffa Wedding Organiser launches website. Apr 22 / Tabaluga's World - NEW VENDOR Balloons & Deco. Oct 15 / Commander Jay has new TV program "It-Takkalja"
Nov 2 / New webpage for Sunday Circle's 2008 Almanac! Sep 19 / New webpage for I DO wedding magazine! Sep 2 / Free Popcorn when watching 'License to Wed'! Aug 25 / Melita Cable Competition Winners announced! Dec 30 / Competitions Closed - Winners to be announced! Feb 4 / Valentine Competition Launched - win 6 red roses! Jan 14 / 'Who Should Walk You Down the Aisle?' by I Do! Dec 25 / You & Me Jewellery Competition Winner announced! Dec 18 / The Floral Designer Competition Winners announced! Nov 23 / Borg's Garage updates photos & services. Nov 9 / New edition of I Do! wedding magazine out in shops. Nov 7 / The Floral Designer updates Flowers section. Oct 30 / Latest news in TV, News & Mags section. Oct 23 / The Floral Designer updates Souvenirs section. Oct 20 / The Floral Designer updates Invitations section. Oct 4 / The Victoria Hotel Competition Winner announced! Sep 25 / Island Caterers Ltd. updates all photos. Sep 24 / Jacqui Cassar (Organiser) updated new photo. Sep 20 / Villa Bologna - new venue from Island Caterers Ltd.
Sep 1 / The Victoria Hotel Competition now closed. Jul 11 / 2 exclusive new competitions launched. Click to win! Jun 17 / Advertise for free in the new Buy & Sell section! 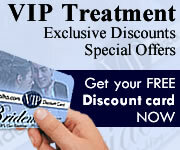 Apr 8 / Free Lm750 Honeymoon from Island Caterers Ltd.
Mar 25 / Happy Easter from the Bridemalta Team! Mar 20 / Free Venue & Special Menu from Island Caterers Ltd.
Mar 8 / Fantasy Flowers - New Flowers & Invitations photos. Feb 24 / Online Contact Form added for all Vendors! Feb 21 / Oliver's Cocktails updated with map. Feb 10 / New Polls. What do you think? Dec 20 / 3 More Love Quotes added. Add your own! Dec 17 / New Love Quotes section - dedicate one! 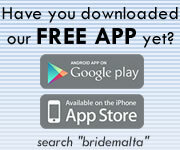 Nov 1 / Bridemalta.com re-launched!